For just a three-piece ensemble, The Joy Formidable certainly know how to pack a punch sounding larger than they physically appear. This North Wales tandem (now by way of London) clearly draw a heavy influence from the distorted guitar-driven drone, better known as shoegaze. 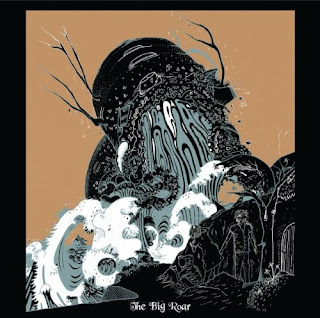 The Big Roar is the band’s first proper full-length album after having released a handful of singles and an EP, 2009’s EP A Balloon Called Moaning in the past. The opening track, "Everchanging Spectrum of a Lie", sets the tone perfectly for what to expect on this album – drawn out fuzz and distorted squall eventually building to massive crescendos, all built around cute contagious vocals from front woman Ritzy Bryan. The Big Roar has many bright spots. I’d defy anyone to listen to singles “Whirring” or “Austere” and not find yourself bouncing with energy within the first 20 seconds of each opening. Both of these songs are unquestionable album highlights, but anyone already familiar with The Joy Formidable before this album’s release have heard it all before. Other than the album’s lead-off track or the very My Bloody Valentine-esque “A Heavy Abacus”, The Big Roar’s definitive moments can already all be found on A Balloon Called Moaning, which some may even say for the better. Aforementioned singles and other tracks have either been expanded or filled out with multi-tracked vocals. More so a matter of being tinkered with and remodeled for the sake of nothing really. But not all is lost. If you are in need of a new guitar-driven shoegaze fix melded with melody along the lines of a Jesus and Mary Train, or if the distorted fuzz of a Sonic Youth or Slowdive is your thing, than really, look no further than The Big Roar.